FAYETTEVILLE – The 13th-ranked Arkansas men’s golf team is poised to capitalize on a strong fall season as it starts the spring portion of its schedule Feb. 4-5. The culmination of the schedule has the Razorbacks hosting the NCAA Championship at the Blessings Golf Course. 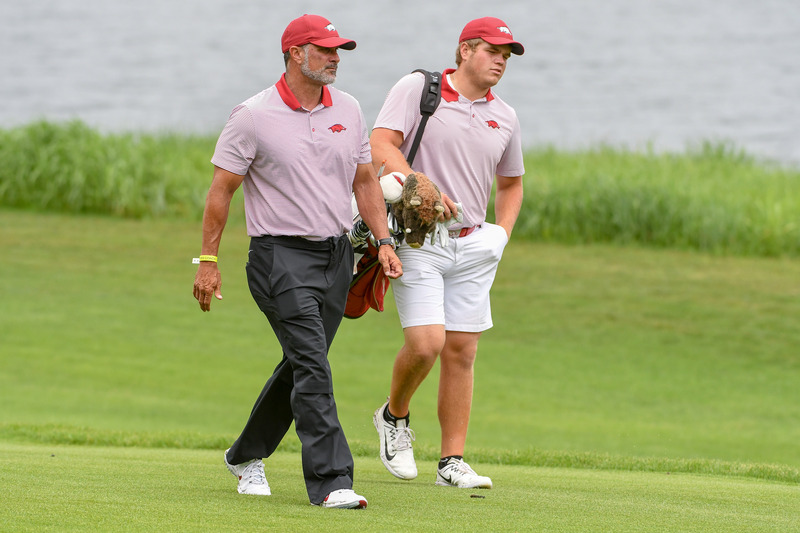 Arkansas will have a strong test to start the spring season at the annual Sea Best Invitational, which is played in Ponte Vedra, Fla., at the TPC Sawgrass Dye’s Valley Course. The 14-team field features eight of the nation’s top 50 programs. The Razorbacks are coming off a strong fall season, facing one of the nation’s toughest schedules. Arkansas finished the fall ranked 13th in the GolfStat national rankings. Arkansas was one of just two programs to have five players ranked among the nation’s top 200. The Razorbacks finished among the top four in each of their five fall events, including a runner-up finish at the Jerry Pate Intercollegiate. Junior William Buhl and freshman Julian Perico each won individual medalist honors. The titles were the first collegiate wins for both. Buhl won the Gopher Invitational and Perico set several school records in winning the Jerry Pate Intercollegiate. The starting five all had scoring averages below 72.2, including Mason Overstreet (70.75), Julian Perico (71.07), William Buhl (71.20), Luis Garza (71.87) and Tyson Reeder (72.13). Mason Overstreet finished among the top 20 in all four of his events, including two top 10’s. Julian Perico had two top 5’s. Buhl and Garza tallied three top 20’s. Overstreet played in two prestigious individual events (Sun Bowl All-America and Patriot All-American) over the break while Julian Perico and Luis Garza recently competed in the Latin America Amateur Championship. In addition to success on the course, the program had an impressive fall in the classroom. Six Razorbacks posted a 3.00 GPA or higher for the fall semester. Seven Razorbacks have a cumulative 3.00 GPA or higher for their career. Thomas Critch and Luis Garza earned Athletic Department Honor Roll. Mason Overstreet earned Champions Honor Roll and he posted a perfect 4.0 GPA for the second straight semester.